After his car flipped end-over-end into the safety fence, shrapnel injuring seven in the crowd, NASCAR's Carl Edwards, in real-life Ricky Bobby-style, exited his fiery wreck, sprinting on foot to the finish. Spoilers inside, obviously. 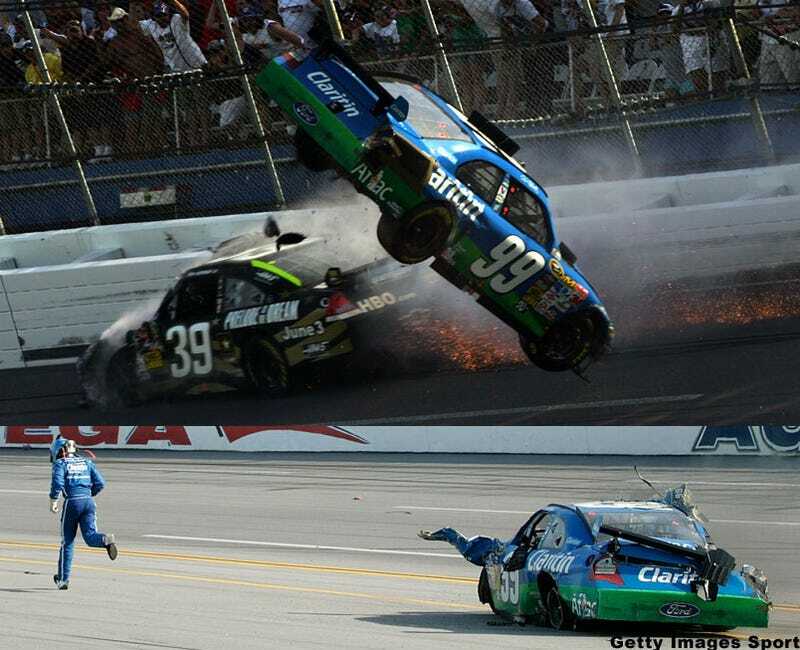 Seven fans sustained minor injuries after being struck by flying debris when Carl Edwards' #99 car went airborne into the safety fence on the final lap of the Aaron's 499 at Talladega Superspeedway on Sunday. While trying to block a move from race winner Brad Keselowski, contact sent Andrews' car spinning over Ryan Newman's hood and into the fence on the frontstretch. Track medical director Bobby Lewis said none of the injuries was life-threatening but two women were airlifted to Birmingham hospitals. Lewis said one, who was taken to UAB Hospital, likely had a broken jaw and also had a cut on her mouth. The other was transported to Brookwood Hospital because of an unspecified medical condition but was not hurt. The other injured fans were treated and released, with two choosing to seek treatment locally from their own doctors, track spokeswoman Kristi King said. It wasn't clear if the fans were hit by debris from the car or the fence. But the best part wasn't until after the crash, when Edwards exited the car, Ricky Bobby-style and took a sprint to the finish line. Heck, when even the NASCAR commentators mention the shades of Ricky Bobby in the action, you know you've got life imitating art. "No. 1, Carl. No. 2, the spectators. It was a sigh of relief when the car came back on the (track)," Hunter said. "I think that's the first time that fence has been hit." Keselowski went on to continue digging a hole, saying he was thankful no one was seriously injured, but said there is some entertainment value to crashes. "I don't want to wreck anyone, but to say a no-contact sport is fun, I don't buy that," he said. "These guys want to see contact just as much as I want to give it and take it." Well, don't we all?